This studio apartment for rent on San Cosme y San Damián, Lavapiés, is a bright and open property with plenty of storage throughout. This 25 m² apartment offers a fully equipped kitchen, living area, bedroom area with a double bed, and a bathroom with a large shower. Located in the Lavapiés area, this property is just outside of the city centre, and is surrounded by things to do and see. The Teatro del Barrio performing arts theatre and the Contemporary Sculpture Collection Renfe are both just a couple of minute's walk from this property. 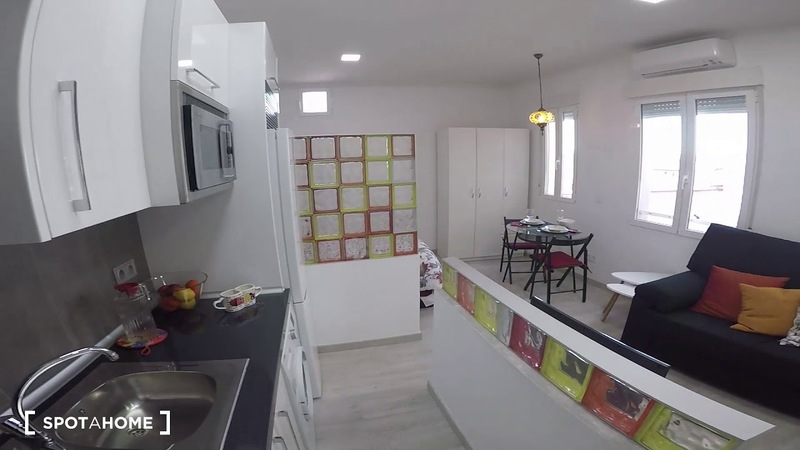 There is a huge variety of restaurants, bars and cafés all within close walking distance of this apartment, and the nearest supermarket is just 2-minutes walk away. The kitchen is fully equipped with everything that you need to cook, as well as the washing machine. The living area is equipped with a sofa, television and a table and chairs. The sleeping area is separated by a small wall, and has a large double bed with more storage in the base. The bathroom is equipped with a large shower, toilet and sink. This property has been recently renovated, and everything is new. This apartment is right in amongst everything that Madrid has to offer, with a huge range of shops and eateries very close. The Lavapiés Metro station is just a 3-minute walk from this property and services line 3. The Desamparados bus stop is a 5-minute walk from this property and services lines 6, 26 and 32.